As medical procedures go, microneedling is a relative newcomer. This therapeutic technique has been used for more than 10 years, to reduce the appearance of acne scars as well as fine lines and wrinkles associated with aging. However, the procedure has gained tremendous popularity more recently, in large part due to advancements in microneedling delivery. SkinPen® from Bellus Medical represents the latest generation of devices. How has SkinPen® advanced microneedling? For years, microneedling was accomplished using a dermaroller. This is a simple mechanical device – literally a small tube studded with surgical steel needles attached to a handle. The needles are a uniform length, usually 1.5mm. Using the handle, the device is rolled back and forth across the desired area, in different directions to improve coverage. This process may help to improve the appearance of fine lines and shallow scars. However, providers say dermarollers can be awkward to use. Further, some patients report the procedure is painful, and their skin remains very red for several days afterward. It is ergonomically designed to fit comfortably in the clinician’s hand. The SkinPen® name comes from the fact that it looks rather like a writing pen. It is automated, powered by a rechargeable battery. The device uses a disposable needle cartridge that contains 12 needles. Needle length can be adjusted to produce optimal results depending on the procedure. Single-use cartridges also help reduce the cost of microneedling and provide a safer single use disposable in comparison to the re-usable roller which could have sanitary concerns. 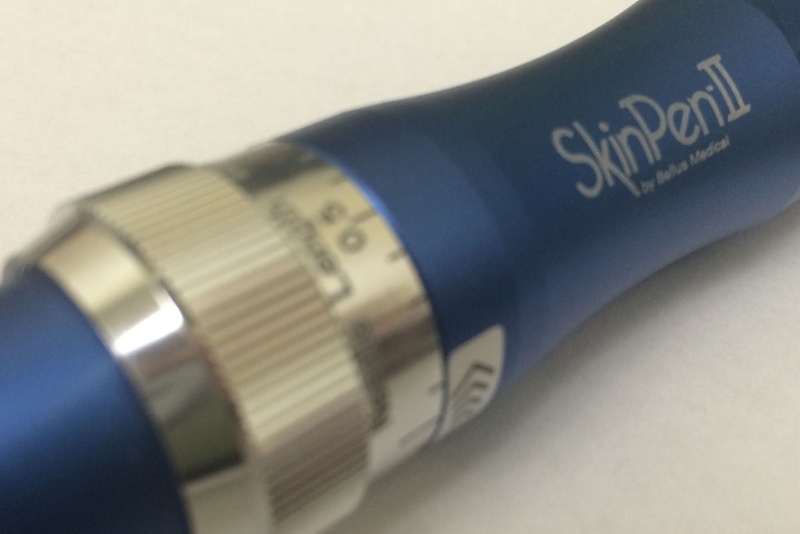 Instead of rolling across the skin, SkinPen® uses a vertical punch-like delivery. This is much more precise. It does not significantly damage the epidermis, and there is no risk to surrounding tissue. Together, the ergonomic design and vertical delivery enable clinicians to effectively treat hard-to-reach areas such as the upper lip and around the nose. Microneedling procedures using SkinPen® may start with the application of a topical numbing agent so patients experience little pain. Specially-formulated post-procedure care products may also be used to moisturize the skin and enhance the skin after the procedure. For all these reasons, SkinPen® has popularized microneedling with men and women with busy personal schedules. The procedure is minimally-invasive, sessions are short, and it requires little downtime. Thanks to equipment innovations such as SkinPen® that improve the microneedling process, medical professionals see an even more versatile future for the procedure. Beyond its original value as a collagen induction therapy for skin rejuvenation and softening acne scars, microneedling is now being used to reduce or smooth the appearance of other types of scars and stretch marks. It is also being used as a transdermal delivery system for vaccines and therapeutic drugs.